Is a muffler nothing more than a steel can with some baffles and tubes inside? That’s how most mufflers look, but there’s a lot more to muffler science than meets the eye. A muffler’s job is to muffle sound. That’s why they are called mufflers. In England they’re called silencers. Regardless of the name, they all do something to change, dampen or absorb the noise-producing pressure pulses in the exhaust. Some mufflers do it by creating resistance with baffles and louvered tubes. Resistance to flow causes the pressure pulses to stack up and dissipate, lowering their energy and the level of sound they produce (which is measured in decibels). When an engine is running, it blows out puffs of exhaust after every cylinder fires. When each exhaust valve opens, hot exhaust gases are shoved past the valve with explosive force. The gases are still expanding as they enter the exhaust manifold and create a pressure wave that pushes rearward through the entire exhaust system. Each pressure pulse represents noise that increases or decreases in frequency with the rpm of the engine. The pressure pulses in the exhaust also create backpressure in addition to noise. As the volume of gas passing through the exhaust system increases with rpm and throttle opening, pressure backs up in the system because of resistance to flow created by the pipes, catalytic converter, muffler and/or resonator. As a general rule of thumb, there should be less than 1.5 psi of backpressure at idle in most exhaust systems. This can be measured by attaching a pressure gauge to the exhaust system anywhere ahead of the converter (an air pipe connection on the exhaust manifold, a diverter valve connection, oxygen sensor connection, or even the EGR valve connection). If there’s a restriction in the exhaust, it will usually cause a higher-than-normal backpressure reading and a corresponding drop in intake vacuum. One of the easiest ways to diagnose a clogged converter or muffler is to connect a vacuum gauge to the intake manifold and watch the vacuum readings at idle. Most engines will have 16 or more inches of vacuum at idle. If the reading is lower than normal, and/or continues to drop the longer the engine runs, it means pressure is backing up in the exhaust and is limiting the engine’s ability to exhale. If you have a dyno, you can make a series of test runs and measure the engine’s power output with different mufflers behind it. Or, you can take the vehicle to the drag strip and see which muffler gives the fastest E.T. Major muffler manufacturers use a more scientific approach. They use test equipment that measures airflow under controlled conditions. The equipment they use is similar to that which a performance engine builder would use to measure airflow through a cylinder head, intake manifold or carburetors. The only difference is that they are measuring airflow through a muffler on a test stand. The purpose of such testing is to evaluate the flow characteristics of a muffler so engineers can develop a replacement muffler that flows the same or better than the original equipment muffler or a competitive muffler. Some laboratory tests feed a simulated exhaust stream of 200 standard cubic feet per minute. This is roughly equivalent to the exhaust output of a 200 cubic inch (3.3 liter) engine running at 3,400 rpm. Backpressure (in inches Hg) is measured at the muffler inlet, and a microphone records the sound level at the muffler’s outlet in decibels. Using this setup, the manufacturer can benchmark and compare the performance of its own mufflers against OEM mufflers and competitive mufflers. The typical stock muffler produces about three inches Hg of backpressure at a flow rate of 200 cfm, but jumps to 16 inches Hg when the flow rate is increased to 300 cfm. This really hurts fuel economy and performance. Many performance mufflers, on the other hand, do a great job of reducing backpressure, but aren’t very good at muffling noise. A straight-through “glass pack” style muffler is about as simple as it gets and offers little restriction to the flow of gas. Another difference that becomes obvious when various brands and types of mufflers are compared on a flow bench is that some flow much better than others. Higher flow numbers mean less backpressure, but flow numbers alone do not tell the whole story because sound control is also important. Even so, two performance mufflers that look identical on the outside and have the same size inlet and outlet pipes can have very different flow numbers. Stock and performance mufflers are available in both direct-fit or universal configurations. You’ll find the greatest selection in universal products, which can be adapted and made to fit almost any vehicle. But the main drawback of one-size-fits-all mufflers is that they sometimes require cutting and welding pipes, and fabricating hangars and mounts. When the stock muffler is removed, the existing pipe may have to be cut, shortened or lengthened. If the pipes are getting weak, they may also have to be replaced to complete the installation. 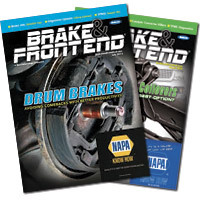 New hangers are often necessary to support the muffler, or existing hangars may have to be repositioned to provide proper support and keep the system from flexing or rattling. Clearance may be another issue, especially with large oversized muffler cans that are not the same size, shape or length as the original muffler. Most of these modifications are not difficult or expensive to make, but they do take time so be sure to take that into account when pricing the job. Direct-fit mufflers usually don’t require any modifications or changes because they are designed to replace the stock muffler perfectly. Most are a simple bolt-in installation that connect to existing pipes and have mounts that line up with the stock hangars. The major drawback with direct-fit custom mufflers is limited availability for less popular models. 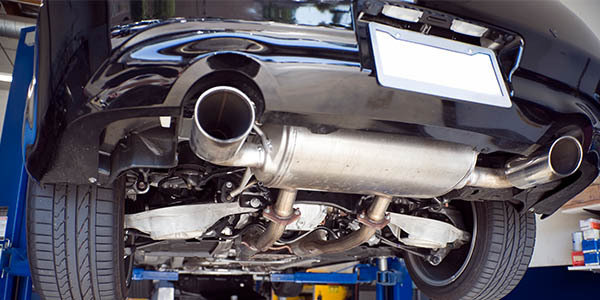 Unless a vehicle is really popular, you may have a hard time finding a direct-fit performance muffler for it. Sound quality is something that’s harder to control with universal-fit mufflers than direct-fit mufflers which have been engineered for a specific vehicle application. 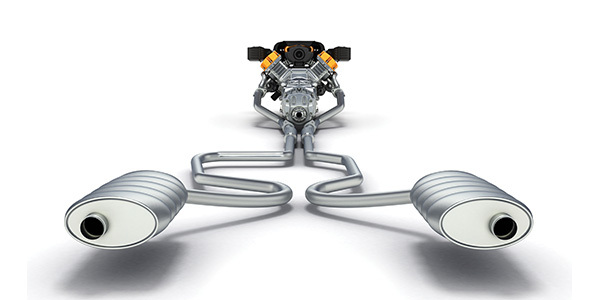 Different engines sound differently and produce different frequencies and harmonics in their exhaust systems. So don’t expect a universal muffler to sound exactly the same regardless of what kind of vehicle it is installed on. It won’t.